Window 10 has many amazing features in it. Window 10 is very much graphical which makes more popular. Microsoft, the founder of the window operating system, tries to make window 10 much better than the other version of windows such as Win 7,8 and 8.1. 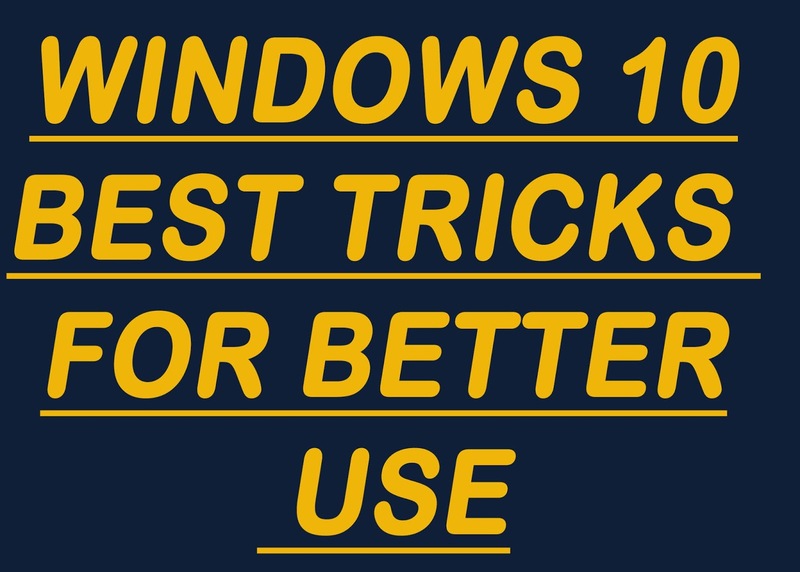 Window 10 is very fast and does not require any driver. All the driver are inbuilt installed in it. This is very good for a common man because it is a tough job to find the right driver and then install it. Window 10 comes in two version 32 bit and 64 bit. Win 32-bit requires 4 GB RAM to work perfectly. If the RAM is less than 4 GB then Window 32 will work, but it will be slow. Win 64-bit requires 6 GB of RAM to work fine otherwise it will be slow. 1. Quick Access To Program and Features: In Other versions of Window, we can access the Program and Features through the Control Panel to install and uninstall the program. First, we have to go to the system and then control panel and at last to reach the Program and Features. But in Window 10, just right click on start button, and then there is a quick button to go to Program and Features. 2. Steps Recorder: A user is can record his step in Windows 10. Suppose your friend find it difficult to install a software in the Windows 10. He is unable to install the software due to some error. Then, he can record all the steps, what he is doing in Windows 10, and send to you to show what is wrong with him. Steps recorder converts all the steps to images and provides the option to save the steps. Just click on search and type the steps recorder. The step recorder application will pop up. 3. Multitasking: Windows 10 provides the option to do multitasking. A user can work on two screens on Windows 10 simultaneously. Moreover, a user can create many desktops on Windows 10. For it, just click on the new desktop icon on the desktop of Win 10. It will create them as much as the desktop you want. This option helps to work two or more users on a single machine. Just close your desktop and another user will work on his desktop without affecting your desktop. When the other user work has done, just close his desktop and open your desktop to work. 4. Storage: A user can view the status of his storage very easily in window 10. No need to go through manually between every drive and folder to see and manage the storage. Window 10 provides the option of storage in system setting to manage it quickly without moving between drive and folders. A user can clean his temporary files also from storage option. Moreover, a user can see which program or apps are installed on that drive. A user can uninstall the program and delete files or folder directly from storage option. 5. Voice Recorder: A user no need to install extra software to record his voice in Windows 10. The Windows 10 has inbuilt option to record the voice. Click on search option and type voice recorder and the voice recorder interface will be opened in front of you. A user can record his voice and save it as mp3 or other formats. Then, the user can edit this voice recording such as trim the voice recording. This feature makes this OS awesome. 6. Cortana - A personal Assistance: Window 10 has a very good option which is personal digital assistance Cortana. This is the same as Apple digital personal assistance. A user can talk to Cortana and ask him to some task. This feature makes the window more popular in the future. 7. Edge Browser with support: The edge browser has a very good look. It has many features now. Now, a user can install the extension in the edge browser also. First, this option was not available in the Microsoft internet explorer. But edge browser has many extension, which a can download from the window extension store. 8. Wifi Hotspot: Window 10 provides a feature with which a user can create it hotspot as in mobile phone provide this option. A user can create wifi hotspot of LAN OR ETHERNET hotspot as well as a user can route his mobile hotspot to other devices thought window 10 hotspot option. This option is under system setting -> Network Setting -> Mobile Hotspot. A user can create the name of his hotspot and put a password on it also. 9. Window 10 Games: This is another cool feature of the window. Window 10 has many games in his store. A user can download the games without paying a single penny to Microsoft and install them into his system. These games do not have a large size and have size up to 1 to 1.5 GB mostly. Some games have heavy sizes also. These games work well on window 10 and do not require the heavy graphics card to run. A user can install some games, even without logging into the Microsoft Account. But some games require logging into the account. Overall this feature is very good provided by the Microsoft in Window 10. 10. No Antivirus Required: Window 10 does not require any antivirus because it has its inbuilt antivirus Window Defender. Window Defender is a good antivirus which is required for a normal person. It provides very good security to the system and it scans and protects the pc from the virus. Microsoft always updates his definition after some time so that it can recognize the latest virus which is running on the internet. This feature is absolutely free of cost. As in earlier version user has to spend some to provide security to his system. Moreover, This antivirus does not slow down the system. As some paid antivirus makes the PC slow which is very annoying for a user. These are the Windows 10 OS Cool Ten Features And Benefits List which I found very useful for the user. If you like the content please comment below.